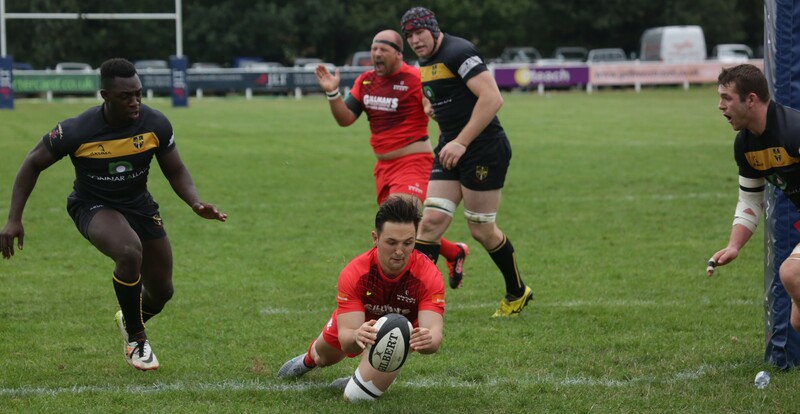 Hartpury lost the corresponding fixture last season, in a game that Esher had dominated, but that outcome never looked likely this time around as they took their third bonus point win in succession. On a cold, grey afternoon in Surrey, this was a match that Hartpury largely controlled, playing at times with a pace and intensity that Esher struggled to match. The star man from last week, Adam Hastings, was unavailable but Jacob Perry was an admirable replacement, scoring a try as well as keeping the scoreboard moving from the kicking tee. There was some rotation in the front row, but otherwise this was largely the team that convincingly beat Plymouth Albion last week. There was a new face on the bench however, as England U20 scrum half, current student Harry Randall, was included for his first taste of National League 1. Hartpury took the initiative from the start and were ahead in the second minute when Perry landed the first of four successful kicks, although this was quickly cancelled out by Esher’s Paul Roberts who slotted the second of two kicks after hitting the post with his first. The first half, though, firmly belonged to the visitors who were happy to mix the punishing drives of Jake Polledri, Mat Gilbert and Rhys Oakley with the option of releasing their dangerous back division. They laid siege to the Esher line and, despite some dogged defence, it was no less than they deserved when winger George Boulton forced his way over in the corner with 14 minutes played. Hartpury continued to operate at a high tempo and added to the score a few minutes later. Esher, under pressure at a defensive line-out, managed to win their own ball metres from the try-line only to cough it up in contact moments afterwards. Alert to the opportunity, Hartpury drove for two phases before quickly moving the ball wide to the left, where Eves’ beautifully timed pass put flyer Harry Cochrane outside his man and in at the corner. A well-struck touchline conversion from Perry was followed by a simpler penalty from under the posts, following an offence for which Esher’s Roberts was yellow-carded. The hosts, to their credit, did not concede further during the sin-bin and grabbed some points of their own when centre Sam Stanley landed a monster penalty to make it 18-6 to Hartpury at the break. The second half started much the same as the first, with Hartpury looking threatening. With six minutes played, a series of powerful charges sucked in the Esher fringe defence and when the ball was moved wider there was plenty of space for Perry to cut through and score near the posts (pictured). With the game looking won, it seemed largely a question of if and when Hartpury would grab the bonus point try. Instead, it was Esher who rallied and had their best spell of the match as Hartpury started to leak unnecessary penalties. Mat Gilbert was deemed to have transgressed once too often in defence and his yellow card created the opportunity for Esher to enjoy the extra man. They took their chance at an attacking scrum which referee Fergus Kirby adjudged to have been deliberately collapsed by the visitors, leading to a penalty try. Having closed the gap to 13 points, Esher may have had a sniff of an unlikely bonus point, but fresh legs off the bench soon had Hartpury looking strong again. Replacements Sebastian Negri, Des Merrey and James Stephenson all showed up well as ball-carrying options, while the nippy Randall eventually got the chance to show his slick skills at half-back. The final 10 minutes saw Hartpury back in command and the fourth try finally came when Gilbert, now restored, was able to drive over from close range to celebrate his first score since his return to the club at the start of the season. There might have been another before the end, but Hartpury were penalised for holding on as the Esher rear-guard continued to get a full work-out. Maximum points from three games is the best start to the season that Hartpury could have achieved and, with no new injury concerns, they will be hopeful of continuing their good run when Fylde visit the College next Saturday. Around the league, Moseley are now the only other unbeaten team after Ampthill were soundly defeated at home, 20-39 by Darlington Mowden Park. Moseley themselves were narrow winners at Ionians, a late try giving them a 22-24 win. There were more close games at Fylde, who went down 24-25 to Blackheath, and at Plymouth where Albion edged out winless Rosslyn Park 26-20. A battle of two newly-promoted sides was also nip and tuck as Old Albanian held out hosts Cambridge to win 34-36. Coventry, our opponents in two weeks’ time, cut loose against Macclesfield picking up nine tries – eight of them before half-time – in a 61-14 drubbing. But the most amazing result of an interesting day came at Blaydon where the home side and visitors Loughborough Students were locked at 38-39 going into the final quarter, before the away team stretched away to win 38-66, or six tries to nine! Our match versus Fylde kicks off at 2.30pm, Saturday 24th September.